Another eye shadow from Kosé I'd like to review is from Fasio. I actually got this because I wanted something green for my hazel eyes, in hope it would bring out the green in my iris, instead of the usual gold/beige or purple I'm wearing. Plus, Fasio was 20% off at my favourite drugstore. Same for the green below. The colour doesn't show up at all, and I have to layer like crazy and rub it onto my lid, which I don't want to do because my lids don't like that. 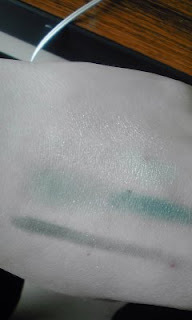 The darker green goes on pretty pigmented with the applicator (the brush part is on the left), but the application is uneven, and usually, it just turns into one big colour pool with the lighter green. The liner applies okay, but of what use is a liner if the rest of the colours look stupid? Anyway, I am kinda disappointed with this item. In the review before, I wrote that Visée's eye shadow, another Kosé product, wasn't my favourite either, which is too bad, because I really love Kosé's Sekkisei's sun lotion.